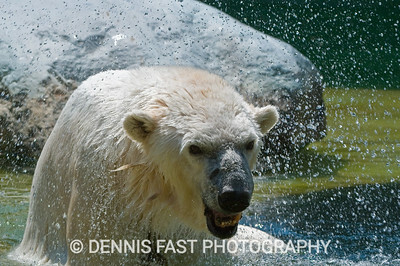 The Assiniboine Park Zoo in Winnipeg, Manitoba, Canada, was the long time home of Debby the polar bear. 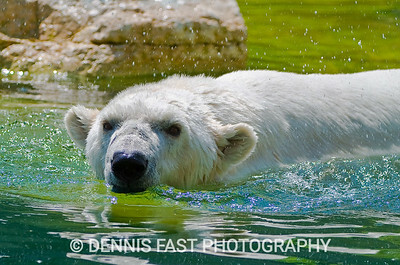 Debby was born in the Russian Arctic in 1966, and arrived at the Assiniboine Park Zoo as an orphaned cub in 1967, Canada's centennial year. 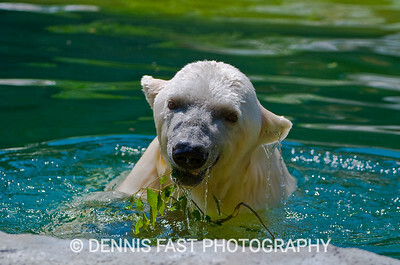 In 2008, the Guinness Book of World Records officially listed her as the oldest polar bear in the world at over 42 years of age. 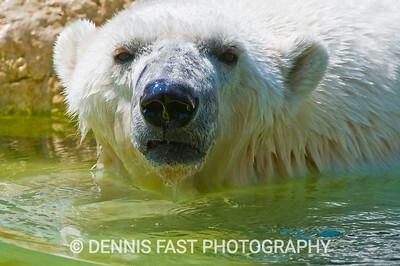 In the wild, most polar bears do not live much beyond 20 years, although older bears have been documented. 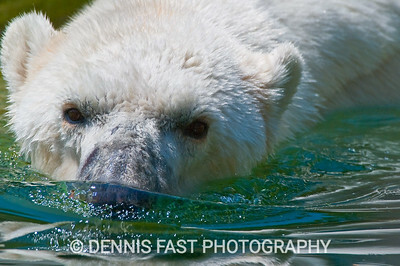 Debby was actually the third-oldest bear of any of the eight species of bears ever recorded. Over the years, Debby had been admired by millions of people from around the globe. As her age increased, so did her reputation, and people increasingly flocked to see the famous bear before she died. Sadly, that day came on November 17, 2008, when Debby had to be put down because of multiple organ failure. I was privileged to photograph Debby on July 17, 2007, just a bit more than a year before her death. 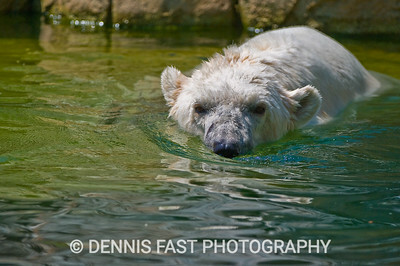 As you can see from my portfolio of photos, Debby could still be quite frisky in the water. 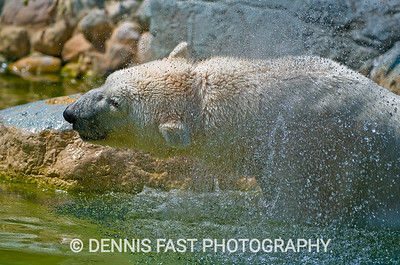 She seemed to enjoy shaking her head after a dive and sending water flying in all directions. The need for a new set of dentures didn't keep her from smiling obligingly for my camera. 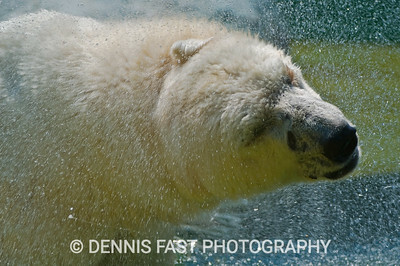 It was a delight to capture her friendly and playful personality in my photographs. 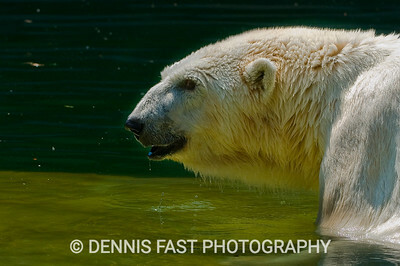 DEBBY THE OLDEST POLAR BEAR IN THE WORLD I was privileged to photograph Debby on July 17, 2007, just a bit more than a year before her death. 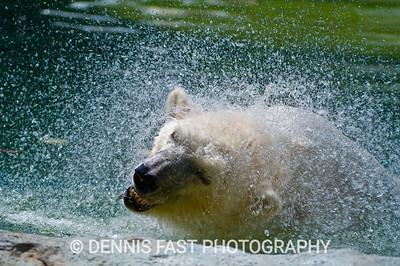 As you can see from my portfolio of photos, Debby could still be quite frisky in the water. 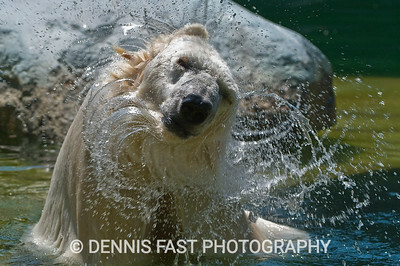 She seemed to enjoy shaking her head after a dive and sending water flying in all directions. The need for a new set of dentures didn't keep her from smiling obligingly for my camera. 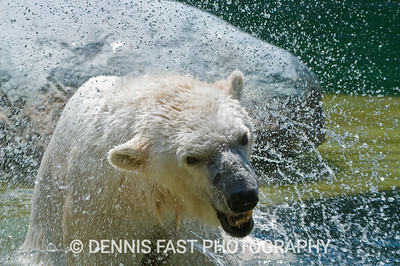 I was privileged to photograph Debby on July 17, 2007, just a bit more than a year before her death. 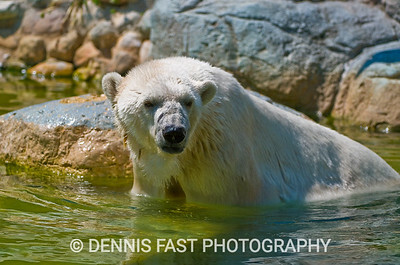 As you can see from my portfolio of photos, Debby could still be quite frisky in the water. 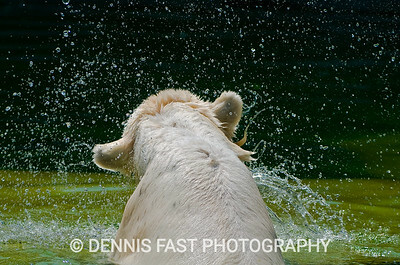 She seemed to enjoy shaking her head after a dive and sending water flying in all directions. The need for a new set of dentures didn't keep her from smiling obligingly for my camera.